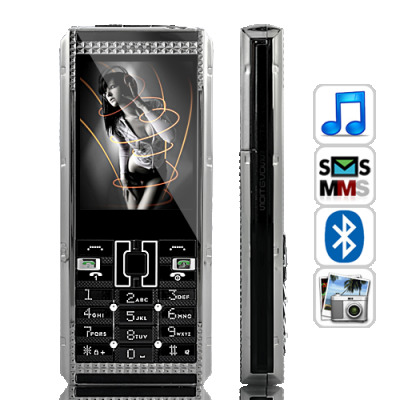 Successfully Added Rondo - Multimedia Triple SIM Mobile Phone with Stereo Speakers to your Shopping Cart. Introducing the Rondo Triple SIM Mobile Phone with Stereo Speakers. Dropshippers, resalers, and music-lovers rejoice - the perfect multimedia phone is here at a price that is too good to be true. Sure, you can get by with one SIM card and one phone number... But what happens when you go on an interview and your prospective employer Google searches your phone number, finds your Facebook page, and sees what you did last Summer? Ouch. That's why this full-featured mobile phone comes three SIM card slots: One for your private life, one for the corporate jungle, and another as a backup for whatever you wish! Music, the world's favorite pastime, and a cell phone, carried around by everyone. The two fit together so well, but only now has a device managed to merge them together so perfectly. Featuring stereo speakers that will knock your socks off, it's about time you find out how good music is suppose to sound on a phone. Make some noise, whenever and wherever, with the Rondo Multimedia Mobile Phone. Just look at it, it's beautiful. The black and silver outline with protruding studs, the candybar form factor that fits perfectly in your hands, and the unique rock and roll design that you can't find anywhere else... Finally, a mobile phone that you can proudly call yours. Deals like this don't last forever, so order today because this multimedia phone is guaranteed to be hot. The Rondo Multimedia Triple SIM Mobile Phone with Stereo Speakers is brought to you by Chinavasion, the leader in wholesale electronics. Cheaper to buy the phone and get it sent from China than to just post the phone back from Australia. I gave this phone to a friend who is very happy with it. They love the triple sim idea and it rings loud enough to hear in a noisy workplace. It has lots of features found on dearer phones, and if you live in Australia, then Chinavasion is DEFINATELY the cheapest way to buy a (quad band) phone. la fotocamera è 1.3 MP non 0.3. software simile Nokia. semplice da usare. Speaker audio molto forte. tasti semplici da usare. Segnalo che NON E' DI PLASTCA!! ma METALLO!! quindi molto robusto! io ne ho comprati 2. I ordered this phone on a Friday Evening for a Friend and it arrived Monday Morning-2 days later (NZ)-that's the fastest delivery so far from Chinavasion I've recieved -Awesome!! The Phone itself was as advertised. The Speaker is quite loud which is what we wanted from the phone mainly and the other features were as mentioned. The buttons are nice and big so you didn't have to squint your eyes or mis-hit any keys! Overall a very satisfied friend with a great phone! Thanks again Chinavasion!! on 2011-06-30 09:05:07 Very Good phone, really ! So, I ordered this phone a few weeks ago, arrived fast. Tried to use it and see what it have. I always used Nokia, and discovered that the phone has the menu very much alike N70. Bluetooth very good, radio super cool, very easy menu, unlocked, three sim cards at the same time (yes, Vodafone, Orange and Movistar at the same time; I live in Spain). No internal memory but compensate it with a 2 GB micro SD Card (class 6 - to be fast). And the cool thing, the photo camera they say is 0.3 mpx, it's not true, it's 1.3 mpx (to be more exact is a 1.22 Mega Pixels, greatest resolution is 1280 x 960 pixels). Also cool are the three buttons on top for the fast access at the multimedia player, very good and loud sound indeed. So these being said, this phone is almost like my old Nokia N70, but better (can use 3 sim cards at the same time), for the price ChinaVasion sells it, it's very recommended ! I hope that in the near future they will sell a phone like this but improved with Wi-Fi g and n , and a better Photo camera, at least 3.2 mpx, that would be awesome !